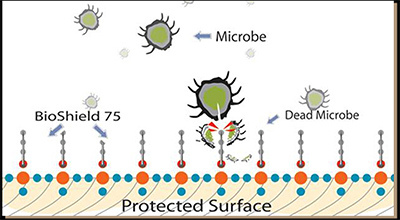 BIOSHIELD 75™ is unique. It creates a stong bond with a multitude of surfaces, porous and non-porous, forming a highly durable protective coating. Its molecules form a microscopic field of “spikes” that puncture microbes without the use of poisons. Since BioShield 75's methodology is mechanical instead of toxious, it does not create "superbugs" which build up a resistance to treatment (much like antibiotics can). Competitors such as Microban use leaching poisons to kill microbes that cause bacteria. Triclosan and triclocarban are antibacterial chemicals commonly added to consumer products. In laboratory studies, they have been shown to disrupt hormones and encourage the growth of drug-resistant bacteria.Bioshield leaches no poisons and creates no super bugs. This is why it is approved by both the USDA and EPA - and therefore, a smart choice for your customers.